Lies can kill. 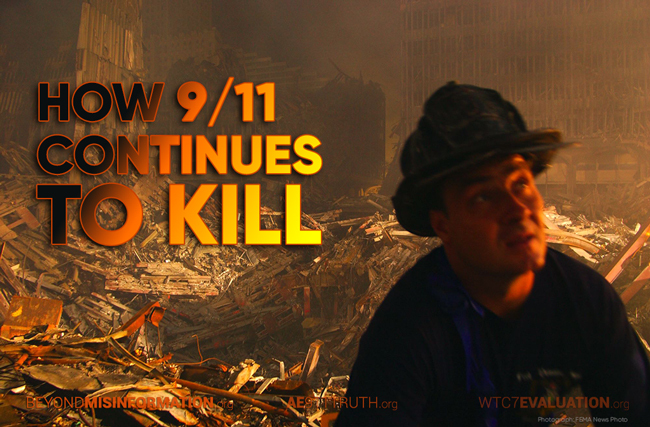 And few lies have killed more than those disguised as the “truth” about what happened on September 11, 2001. Today, more than 15 years after 9/11, exposing those lies is as relevant and necessary as ever. Not only does the false official narrative about what brought the World Trade Center towers down continue to claim victims in the global “war on terror,” but the false claims about the air quality at Ground Zero on 9/11 and in the weeks and months that followed are still killing hundreds and making thousands of others seriously ill. The numbers of first responders, recovery workers, and residents of lower Manhattan who are affected aren’t falling; they’re rising sharply. Even those exposed to the toxic dust and air at Ground Zero who have not become sick have no way of knowing whether that day is lying in wait. . . Awhile back I recommended a book by Rebekah Roth, Methodical Illusion, a fictional account based around the events of 9/11. Rebekah had made the talk show circuit, touting her book and a second one Methodical Deception. She seemed credible, claiming that her background as a 25-year former flight attendant had provided her with insights into the suspicious nature of the calls allegedly made from the planes on the day of the 9/11 attacks. My posting drew the attention of a reader, who contacted us about her veracity. It looks like he may have been on to something. Apparently Rebekah Roth is a former snake oil salesman, who used the name Monica Gaynor. There is no evidence that she ever worked as a flight attendant. Neither names are her real name according to Kurt Haskell, who has investigated her background. According to Jim Fetzer, during a Skype call with Dennis Cimino, he noticed that her I.P. address was Langley, Virginia. When questioned about it, she claimed she was using a proxy server. Who uses the CIA for a proxy server? Rebekah Roth's radio show at TalkNetwork.com has since been taken down. Former flight attendant turned researcher, truth teller and author Rebekah Roth joins me on the 14th anniversary of 9/11 to discuss her new book 'Methodical Deception', the follow up to her very popular first book 'Methodical Illusion'. Both books are available here. In this interview Rebekah drops some bombshells which prove not only that 9/11 was a false flag event long in the planning, but that the operation itself leads directly back to companies and intelligence assets deeply rooted in and connected to the state of Israel. In fact, some of the information shared in this remarkable interview is so critical for every American to understand that even if you don't want to listen to the full interview, at least make sure you fast forward to the 31:20 mark. Because as Rebekah puts it, "This is the elephant in the room that nobody wanted to talk about." The pictures you will see and the information you will hear may well shock you to your core. Share it with your friends and family. Every single American citizen should know the truth about what happened on 9/11 and the months leading up to it – and who the REAL culprits were. This is my second interview with Rebekah Roth, former flight attendant turned researcher, truth teller and author. In this interview Rebekah and I discuss some extremely disturbing new evidence that speaks directly to the Israeli art students and their premeditation and intent to murder the occupants in the world trade centers. 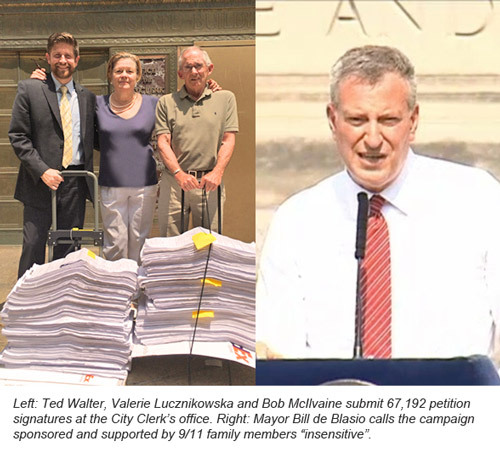 Two weeks ago we had the satisfaction of being present for the submission of 67,000 signatures calling for a ballot measure to require the City of New York to investigate the collapse of WTC 7. A week later, as word of the campaign spread, Mayor Bill de Blasio made his position known, calling our efforts "insensitive" and "inappropriate", and saying that he would work with the City Council to keep it from appearing on the ballot. Now we need your help to fight back. Already, the Mayor and City Council Speaker are moving to have the City Council vote down our proposal so that it does not appear before the voters. But we can override their veto by a submitting second petition on September 4th. Please donate what you can today so that we will have enough funds to finish the job we started. With all eyes on us, it is imperative we submit the second petition, or we will have little chance of appearing on the ballot this November. Visit HighRiseSafetyNYC.org/donate to make your contribution. We thank you for digging deep at this important juncture in our efforts, and we are grateful for the generosity that so many of you have shown already. Your incredible support makes our work possible. Donate Now to High-Rise Safety Initiative! June 3, 2014 –The 24-member 9/11 Consensus Panel – which includes physicists, chemists, engineers, commercial pilots, attorneys and lawyers – today announced three new studies confirming the controlled demolition of World Trade Center 7. The studies scientifically refutes the U.S. National Institute of Standards and Technology (NIST) claim that, for the first time in history, fire caused the sudden and complete collapse of a large, fire-protected, steel-framed building on 9/11. The first Panel study deals with the NIST computer simulations, which purported to show that fire-induced thermal expansion caused a girder to be pushed off its seat at Column 79, thereby initiating a global collapse of the entire 47-storey building at 5:21 in the afternoon. 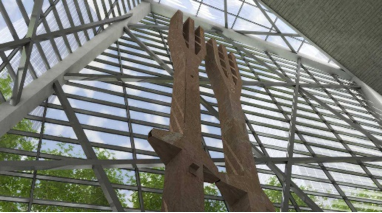 However, a recent FOIA request has produced WTC 7 architectural drawings showing that the NIST simulations omitted basic structural supports that would have made this girder failure impossible. The second Consensus Panel study deals with NIST's claim that it did not recover any steel from this massive steel-frame skyscraper. This is extraordinary, given the need to understand why a steel-frame building would have completely collapsed for the first time in history from fire alone, and to thereby prevent a recurrence. We know now that some of the steel was recovered. Photographs recently obtained by researchers show the strange curled-up paper-thin WTC 7 steel, with a NIST investigator pointing it out. The third Panel study shows that on September 11, 2001, many people were told hours in advance that WTC 7 was going to collapse. MSNBC reporter Ashleigh Banfield said early in the afternoon: "I've heard several reports from several different officers now that that is the building that is going to go down next." Firefighter Thomas Donato: "We were standing, waiting for seven to come down. We were there for quite a while, a couple hours." Assistant Commissioner James Drury: "I must have lingered there. There were hundreds of firefighters waiting to -- they were waiting for 7 World Trade Center to come down." Chief Thomas McCarthy: "So when I get to the command post, they just had a flood of guys standing there. They were just waiting for 7 to come down." In addition, CNN and the BBC made premature announcements. This foreknowledge corroborates the evidence presented in previous Consensus Points (WTC7-1 to WTC7-5) that WTC 7 was brought down by controlled demolition. History has shown us that in order to maintain an official myth, there must be an official consecration of that myth. Unfortunately, this is what will be taking place at Ground Zero on May 21, 2014. It's the opening of the 9/11 Memorial Museum, an elaborate, taxpayer-funded, public relations campaign to forever cement the fantastic claims of the official conspiracy theory into the history books. And that is why we are now reaching out to you. Museum visitors will be presented with a first-rate "Madison Avenue" account of September 11th that has served as the justification for two wars, demolished our national economy, and deprived us of our privacy and civil liberties. This historical revisionism needs to be countered with an all-out effort of the truth of 9/11. 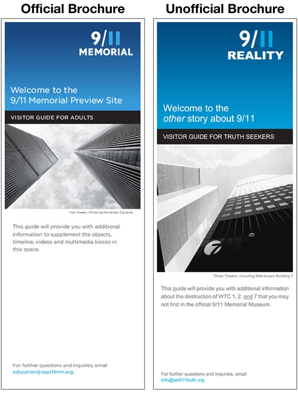 By printing thousands of educational flyers and distributing them via teams of AE911Truth volunteers at the memorial grounds entry, we can inform the public as to why the 9/11 Memorial Museum is largely a fraud. And we can do it with facts – facts that will educate museum visitors enough to ask a few simple questions: "Where are the exhibits of red/gray thermitic chips or the displays showing melted steel? Where are the photographs of the explosive "squibs" – the videos showing WTC 7's seven-second collapse? Where are the archived accounts of elevator rebuilds – the fleeing Ace Elevator mechanics – the wall plaques with quotes of the first responders citing countdowns and explosions? If we can get the truth in front of the public, we can show the impossibility of the official story and why it has no good place in the world our children will inherit. We hope to present the truth about 9/11 with a live multimedia speaking engagement with Richard Gage, AIA: "9/11 Blueprint for Truth" on Saturday afternoon, May 24, at 4 PM at the Community Church of New York. But it can't happen without you. If there ever was a time to jump into the fray, the time is now. Your donation is immensely appreciated and will help us to set the record straight! And join us if you can in New York on Wednesday, May 21, and Saturday, May 24, for street-level education of the public – and the days in between if possible. We'll be at the memorial grounds entry at the corner of Greenwich and Liberty streets -- starting at 10 AM. If you can't join us, you can sponsor someone else to come!